To Cite: Fozouni L, Javidmehr S, Barghamadi H, Mazandarani A, Rouhafza S. Antibacterial Effect of Zinc Oxide Nanoparticles on Group A β-Hemolytic Streptococci with Macrolide Resistance Isolated from University Student Carriers in North of Iran, Int J Infect. 2019 ; 6(1):e85732. doi: 10.5812/iji.85732. Background: The increase in the resistance of group A β-hemolytic streptococci (GABHS) to antibiotics is considered as a serious threat to human health. Objectives: The current study aimed at determining the antimicrobial effect of zinc oxide nanoparticles (ZnONPs) on the growth of erythromycin-resistant GABHS harboring mef gene isolated from university student carriers. Methods: The study was conducted on 100 healthy students from Islamic Azad University, Gorgan Branch. Specimens were collected from the nasopharyngeal region using sterile swab. After biochemical tests to identify GABHS, resistance to various antibiotics was determined using agar disk diffusion test (the Kirby-Bauer method). The minimum inhibitory concentration (MIC) of erythromycin was also determined by broth micro-dilution test. The macrolide resistance gene (mefA) was identified by polymerase chain reaction (PCR) using specific primers, and the antibacterial properties of ZnONPs were evaluated by agar-well diffusion method. The data were analyzed by chi-square and ANOVA tests (P < 0.001). Results: In the current study, the frequency of GABHS carriers was reported 11%. The highest amount of bacterial resistance was correlated with erythromycin with the frequency of 45.4%. Also, 91% of the isolated streptococci were susceptible to cefazolin, followed by cefalexin (82%), penicillin (73%), and amoxicillin (46%). Besides, 43% of the erythromycin-resistant isolates had the MIC of ≥ 1 µg/mL. From the five isolates resistant to erythromycin, 60% harbored the mefA gene. The results of agar-well diffusion test showed that 40% of the strains, which were resistant to erythromycin and harbored mefA gene, were inactivated in the concentration of 50 mg/mL of ZnONPs, and the rest were also inactivated in the concentration of 100 mg/mL. Conclusions: The ZnONPs used in the current study had a high antimicrobial activity against all GABHS isolates that were resistant to erythromycin. It was revealed that the bactericidal property increased upon increasing the concentration of the nanoparticles. Group A β-hemolytic streptococci (GABHS) is considered as the main cause of bacterial pharyngitis in children, adolescents, and youths (1). The infections caused by these bacteria include otitis, sinusitis, pneumonia, skin and soft tissue infection, cardiovascular system infections, osteomyelitis, bacteremia, toxic shock syndrome, meningitis, and encephalitis (2, 3). Rheumatic fever and glomerulonephritis are the most common non-septic complications of this infection. Most of the cases of streptococcal pharyngitis occur during winter and early spring, and considering the fact that these bacteria are transmitted through contact with the infected people or carriers especially in communities, it is more probable that the bacteria are transmitted to school pupils and university students; to such an extent that about 15% - 20% of such people are the healthy carriers of GABHS (4, 5). Unfortunately, resistant strains of these bacteria are developed as a result of excessive use of antibiotics, leading to difficulties in treating some patients. Although penicillin G is a selective agentto treat this infection, erythromycin is recommended in patients allergic to this antibiotic (6). Macrolides mainly act by preventing protein synthesis in bacteria, which leads to antibacterial effects of macrolides as a result of reversible binding of macrolides to P region in the 50S ribosomal subunit of the bacteria (7). Ribosomes are intrinsically resistant to erythromycin. This single-stage resistance developed in higher concentrations of the drug is resulted by chromosomal mutation. Another type of resistance found in clinical samples is related to a change in the 23SrRNA from 50S ribosomal subunit (8). Most studies referred to the mef (A) gene as the dominant gene, which determines macrolide resistance in GABHS (9). Therefore, it is recommended to employ various antimicrobial materials to inhibit or control such resistances. Due to their interesting optical and chemical properties, metal nanoparticles are so far frequently studied, and they also play a fundamental role in biotechnology. Zinc oxide nanoparticles (ZnONPs) are among the most important nanoparticles used in industrial scale and medicine in many countries due to their strong activity against bacteria. Today, zinc oxide is regarded as one of the safest and most-used nanoparticles to cover Gram-positive and Gram-negative bacteria (10). The current study aimed at determining the frequency of drug resistance, especially macrolide resistance, in GABHS isolated from university student carriers, as well as studying the antibacterial effect of ZnONPs on isolates in vitro. In the current cross sectional study, conducted from 2018 to 2019, a total number of 100 male and female students from Islamic Azad University, Gorgan Branch, in North of Iran were randomly selected and studied. After obtaining informed consent, samples were collected from the nasopharyngeal region as well as the surface of both tonsils and the holes behind them using sterile swab. Students who had taken any antibiotics during the month before the test, and the ones with symptoms such as fever, chill, sore throat, cough, headache, rhinorrhea, and inflammation or redness of pharynx mucosa were excluded from the study. The age range of the samples was 18 to 27 years. Samples were cultured on blood agar containing 5% sheep blood, and then incubated for 24 hours at 37°C in a jar containing 5% carbon dioxide. In the next step, group A streptococci were identified and isolated using Gram staining method, catalase test, and hemolysis on blood agar, as well as bacitracin and SXT susceptibility, sodium hippurate hydrolysis, and PYR (pyrrolidonyl aminopeptidase) tests. After preparing the 24-hour culture from GABHS isolates, a bacterial suspension of 0.5 McFarland standard was cultured on the Müller-Hinton agar (Merck, Germany), containing blood. Then, discs of erythromycin (15 µg), penicillin (10 µg), amoxicillin (25 µg), cefazolin (30 µg), and cephalexin (30 µg) purchased from Padtan Teb Co. (Iran) were placed on the culture plate. After 20-24 hours incubation at 37°C and exposure to 5% carbon dioxide, according to standard tables of CLSI (Clinical and Laboratory Standards Institute), the diameter of the inhibition zone around each disc was measured and the results were classified into three categories of resistant, semi-susceptible, and susceptible (11). In order to determine the MIC of erythromycin, broth microdilution test was applied. To prepare the erythromycin stock, sufficient amounts of antibiotic powder (Sigma-Aldrich, USA) were added to ethanol solvent 95%. To carry out broth microdillution test, first, Müller-Hinton broth (Merck, Germany) was poured into the 96-well ELISA (enzyme-linked immunosorbent assay) plate. Then erythromycin serial dilution from 8 to 0.015 µg/mL was prepared. In the following steps, the bacterial suspension of 0.5 McFarland standard was added to wells and the microplate was incubated for 24 hours at 37°C. Two wells were considered as negative and positive controls. The negative control well contained drug stock with Müller-Hinton broth, and the positive control well contained Müller-Hinton broth with bacterial suspension. The minimum concentration for the antibacterial agents that inhibit bacterial growth up to 90% in comparison with the positive control is considered as MIC90. Findings were compared with CLSI standard tables. According to the instructions of CLSI, the GABHS strains with MIC ≤ 0.25 µg/mL were considered as susceptible, the ones with MIC = 0.5 µg/mL were considered as semi-susceptible, and the ones with MIC ≥ 1 µg/mL were considered as resistant to erythromycin (11). The standard strain of Streptococcus pneumoniae ATCC 49619 was used to control antibiotic susceptibility tests. In order to extract genomic DNA of GABHS, a DNA extraction kit with the catalogue No. DN8115C (CinnaGen, Iran) was used. 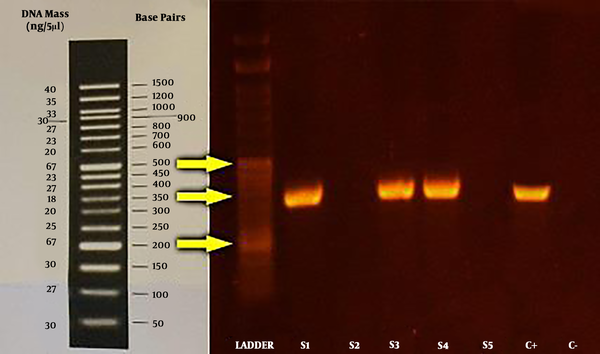 For quantitative analysis of the extracted DNA, spectrophotometry in the wavelength of 260/280 nm and electrophoresis on 1% agarose gel were applied. The macrolide resistance gene (mefA) was then identified by polymerase chain reaction (PCR) using specific primers (Table 1) (12). The PCR was perfoemed in the final volume of 25 µL, including 1 µL of the DNA sample, 1 µL of each forward and reverse primers, 0.5 µL of dNTP, 2.5 µL of PCR buffer, 0.75 µL of magnesium chloride, 0.2 µL of Taq polymerase enzyme (5 U/µL) and 18.05 µL of distilled water. The microtube containing PCR materials and the genomic sample was placed in a gradient cycler. In the thermocycler (Techne TC-312 Thermal Cycler, the UK), the target genes underwent a primary denaturation program at 94°C for five minutes, followed by 35 cycles including a denaturation program at 94°C for one minute, annealing at 63°C forone minute, extension at 72°C for one minute, and the final extension at 72°C for five minutes. In the end, the final product was mixed with the sampling buffer with the ratio of 5:1, and each mixture was inserted into 1% agarose gel wells. The bands were then observed using Gel Doc device. The antibacterial properties of ZnONPs were studied by agar-well diffusion method. To this end, first 0.2 g of ZnONPs (Nanopishgaman, Iran) with the size of 20 nm were added to a sterile tube containing 2 mL of sterile distilled water and 20% dimethyl sulfoxide (DMSO) in order to achieve the final concentration of 100 mg/mL. The tube was shaken for 30 minutes and then sonicated. Accordingly, sequential concentrations of 50, 25, 12.5, and 6.25 mg/mL were prepared from ZnONPs powder in sterile distilled water. In order to study the antimicrobial effect of various concentrations of the nanoparticle, a bacterial suspension of 0.5 McFarland standard was prepared from all erythromycin-resistant isolates, and was cultured on a blood agar containing 5% sheep blood. Then, 7-mm diameter wells were punched on the culture medium, and 100 µL of each ZnONPs concentration was poured into the wells. One well containing distilled water was considered as the negative control. As soon as the nanoparticle samples were added into wells, the plates were incubated at 37°C in a jar with 5% carbon dioxide. After 24 hours, the diameter of the inhibition zone around each well was measured and recorded in millimeters. Creation of inhibition zone of over 12 mm was considered as susceptible to ZnONPs, and the ones with a diameter of equal or smaller than 10 mm were considered as resistant to the nanopaticles. The data were analyzed using chi-square test and one-way ANOVA with Excel 2007 and SPSS version 18. P < 0.001 was considered as significance level. In the current study, 11% of the isolates were identified as GABHS. The strains were mostly isolated from male students (55%) and the highest bacterial resistance was observed against erythromycin (45.4%); 91% of the isolates were susceptible to cefazolin, followed by cefalexin (82%), penicillin (73%), and amoxicillin (46%) (Table 2). The MIC90 of erythromycin was 1 µg/mL for GABHS. The MIC range in comparison with the range of the standard strain was 0.25 - 8 µg/mL, so that 43% of them were within the MIC range of ≥ 1 µg/mL. PCR final products were electrophoresed on 1% agarose gel. Visualization of a 346-bp fragment was considered as positive sample (Figure 1). In the current study, 60% of erythromycin-resistant isolates also harbored mefA gene. The results of antimicrobial effects of ZnONPs on the growth of antibiotic-resistant strains showed that 40% of the erythromycin-resistant strains carrying mefA gene were deactivated when exposed to 50 mg/mL of the nanoparticles, and the rest were also deactivated in 100 mg/mL concentration. The results also showed that none of the erythromycin-resistant strains could grow in >50 mg/mL concentrations (the bacteriocidal property increased upon the increase of the concentration). The results of ANOVA showed a significant relationship between the concentration of ZnONPs and the diameter of the inhibition zone of the bacteria (P < 0.001) (Table 3). a Diameter of the inhibition zone, mm. In the current study, common biochemical tests were employed to identify GABHS. The PYR test is much more specific than the bacitracin test, since none of the B-, C-, or G-group streptococci show a positive reaction to PYR test (13). In the current study, the frequency of the healthy pharynx carriers of GABHS was 11%; while Mohsenimoghaddam et al. reported the same frequency as 1.8% in children in the city of Rafsanjan, Iran (14). Nabipoor and Tayarzadeh reported this frequency as 28.5% (15), which was higher than that of the study by Kocoglu et al. (4%) (16). Perhaps the difference between the results of the current study and those of previous studies is attributed to different climatic conditions, the season in which the tests were performed, the geographical region, and the age of the carriers under studies. The streptococci in carriers cause no risk for them, but the carriers act as the main reservoir for the spread of infection in the community, which brings potential risks for other people (4). It also shows improper treatment using the common methods. Tarvij Eslami and Nasirian reported that GABHS have a high susceptibility to penicillin and so far no penicillin-resistant strain has been reported (17). In the current study, 73% of the GABHS were susceptible to penicillin, which was close to the results reported by them. In a study, Gordon et al. found out that 99.3% of GABHS isolated from patients were susceptible to penicillin, which is the highest rate of susceptibility among the released findings (18). Therefore, penicillin could still be regarded as a proper selective agent for this infection. Unlike other studies (19, 20), the results of the current study showed that resistance of GABHS to erythromycin, cefalexin, cefazolin, amoxicillin, and penicillin in the community of university students was 45%, 9%, 10%, 36%, and 27%, respectively, and it seems that the antibiotic resistance was quite relative. In a study by Sharefiyan et al. GABHS isolated from patients were reported to be100% resitant to penicillin and kanamycin, 68% to amoxicillin, and 100% to vancomycin (21); while resitance to amoxicillin and penicillin was reported as much lower in the current study. Despite the efficacy of penicillin to treat GABHS-caused pharyngitis, studies in most parts of the world are focusing on the employment of cephalosporins either as the preferred agent or as a replacement for penicillin in case of allergy. However, it should be noted that few cases of resitance to cephalosporins were reported in some parts of the world as well. For instance, in a study conducted in 1989 in Turkey, susceptibility to cefalexin was reported as 78% (22). In the current study, susceptibility of GABHS to cefalexin and cefazolin was reported 82% and 91%, respectively. Although these agents seem to be more effective than penicillin, the use of penicillin is still regarded to be reasonable as the first choice in treating streptococcal pharyngitis due to the high price of cephalosporins compared with penicillin on one hand, and insignificant statistical difference in susceptibility to cephalosporins in comparison with penicillin on the other hand (23). In recent years, amoxicillin is used less frequently against GABHS worldwide, as many cases of resistance are reported to this antibiotic. For instance, Cengiz et al. reported 17% resitance to amoxicillin in their study in Turkey (22). In the current study, 46% of the isolates were susceptible to amoxicillin. Some researchers also reported the resistance of GABHS to erythromycin as 4% in Western countries. The rate was reported as 68% in Serbia (24), 5% in Romania (25), 4.6% in Korea (26), and 3.2% in France (27). While in some other countries, a high resistance is reported to erythromycin; the resistance to this antibiotic was higher in Spain, Italy, Finland, and Japan (2), which was almost in line with the results of the current study. In the present study, 45% of GABHS isolates were resistant to erythromycin, which is probably due to excessive and inappropriate use of this antibiotic. It was reported as 96.8% in a study conducted in China (28). Understanding the mechanism of resistance is of paramount importance in studies targeting macrolide resistance, as it provides researchers with valuable information on distribution of resistance genes. The results of the current study, which was carried out in line with similar studies conducted in Germany (9), the UK (29), and Iran (30), confirmed that most erythromycin-resistant samples harbored mefA gene. A study by Kargar et al. showed a significant relationship between erythromycin resistance and the frequency of mefA gene harboring (31); also, D'Ercole et al. screened 124 S. pyogenes isolates for the presence of mef (A) and the frequency was reported as 25.8% (32); while in North Lebanon only 2.2% of isolates harbored mefA gene (33). These findings revealed that the prevalence of resistant bacteria harboring mef gene is rising in most countries. One of the promising solutions to overcome bacterial resistance is the application of metal nanoparticles (34). In the current study, none of the erythromycin-resistant strains could to grow in high-concentration ZnONPs. Tayel et al. studied the antibacterial effect of ZnONPs on six bacterial strains, and applied microdilution method to determine the MIC. They realized that although all of the studied agents had antimicrobial properties, ZnONPs had the most inhibitory effect (35). Ghaderian et al. studied the antibacterial effect of ZnONPs on Escherichia coli and Enterococcus faecalis strains, and found that the largest inhibition zone against Escherichia coli belongs to 100 mg/mL concentraion (36). By studying the effect of zinc on the growth of staphylococci, Atmaca et al. found that zinc could inhibit the growth of these microorganisms (37). The probable mechanisms to explain the antibacterial activity of ZnONPs could be associated with the induction of oxidative stress due to the production of active oxygen radicals, the reaction of these active oxygen radicals with DNA, proteins, and lipids, and ultimately, death of cells and destruction of membrane conformation as a result of accumulation of nanoparticles in the bacterial membrane and inside the cell (38). Precise identification of healthy pharynx carriers of GABHS as the potential cause of infection spread in the community as well as pharyngitis and drug resistance seems quite essential. With regard to the results of the current study, cephalosporins could be used as the first choice to treat streptococcal pharyngitis. Furthermore, due to the resistance of GABHS to erythromycin and lower susceptibility of these bacteria to amoxicillin in comparison with other abtibiotics under study, caution should be taken while using these agents to treat streptococcal pharyngitis. The results of the current study also showed that ZnONPs in low densities prevent GABHS from growing in vitro; hence, they could be considered as an antimicrobial agent as well. Further studies can be very helpful to prevent primary and secondary infections caused by these bacteria. The authors are grateful to all who helped them as well as the staff of the Microbiology Lab at the Islamic Azad University, Gorgan Branch, Iran. Authors' Contribution: Leila Fozouni: Study concept and design, supervision of the project, and editing the ﬁnal copy of the manuscript; Sepideh Javidmehr, Hadiseh Barghamadi, Anahita Mazandarani, and Somaye Rouhafza: Sample collection, laboratory examinations, and interpretation of data. All authors discussed the results and implications and provided their comments on the manuscript. Ethical Considerations: We didn't need this code. Financial Disclosure: There was no ﬁnancial disclosure. 1. Kliegman RM, Behrman RE, Hal BJ, Stanton BF. Nelson textbook of pediatrics. 18th ed. Philadelphia: WB. Saunders; 2007. p. 1135-9. 2. Brook I, Dohar JE. Management of group A beta-hemolytic streptococcal pharyngotonsillitis in children. J Fam Pract. 2006;55(12):1-11. 3. Kern L, Rassbach C, Ottolini M. Streptococcal pyomyositis of the psoas: Case reports and review. Pediatr Emerg Care. 2006;22(4):250-3. doi: 10.1097/01.pec.0000210177.48386.e7. [PubMed: 16651916]. 4. Mandell GL, Bennett JE, Dolin R. Principles and practice of infectious disease. 6th ed. Philadelphia: Churchill Livingstone; 2005. 5. Kasper DL, Braunwald E, Hauser S, Longo D, Jameson JL, Fauci AS. Harison s principles of internal medicine. 16th ed. New York: Elsevier; 2005. p. 824-5. 6. Cohen R. Defining the optimum treatment regimen for azithromycin in acute tonsillopharyngitis. Pediatr Infect Dis J. 2004;23(2 Suppl):S129-34. doi: 10.1097/01.inf.0000112527.33870.0d. [PubMed: 14770076]. 7. Kanungo R. Macrolide resistance mechanisms in Streptococcus pneumoniae: Opening Pandora's box. Indian J Med Microbiol. 2016;34(1):5-6. doi: 10.4103/0255-0857.174123. [PubMed: 26776111]. 8. Rudolph K, Bulkow L, Bruce M, Zulz T, Reasonover A, Harker-Jones M, et al. Molecular resistance mechanisms of macrolide-resistant invasive Streptococcus pneumoniae isolates from Alaska, 1986 to 2010. Antimicrob Agents Chemother. 2013;57(11):5415-22. doi: 10.1128/AAC.00319-13. [PubMed: 23959308]. [PubMed Central: PMC3811267]. 9. Bley C, van der Linden M, Reinert RR. mef(A) is the predominant macrolide resistance determinant in Streptococcus pneumoniae and Streptococcus pyogenes in Germany. Int J Antimicrob Agents. 2011;37(5):425-31. doi: 10.1016/j.ijantimicag.2011.01.019. [PubMed: 21419605]. 10. Zhang L, Ding Y, Povey M, York D. ZnO nanofluids – A potential antibacterial agent. Progress in Natural Science. 2008;18(8):939-44. doi: 10.1016/j.pnsc.2008.01.026. 11. Clinical and Laboratory Standards Institute (CLSI). Performance standards for antimicrobial susceptibility testing: M100-S17. 2008. 181 p.
12. Bingen E, Fitoussi F, Doit C, Cohen R, Tanna A, George R, et al. Resistance to macrolides in Streptococcus pyogenes in France in pediatric patients. Antimicrob Agents Chemother. 2000;44(6):1453-7. [PubMed: 10817692]. [PubMed Central: PMC89896]. 13. Goldman L, Ausiello D. Cecil textbook of medicine. 22nd ed. Philadelphia: WB; 2004. p. 1782-6. 14. Mohsenimoghaddam F, Shahidizandi B, Shabani Shahrbabak Z, Rezaeian M, Jafarpour P, Hadavi M. [Antibiotic resistance pattern on beta hemolytic (A) streptococci among Rafsanjan's secondary school pupils in 2009]. J Rafsanjan Univ Med Sci. 2013;12(4):291-8. Persian. 15. Nabipoor F, Tayarzadeh MA. [Beta hemolytic group a Streptococcal drug resistant to penicillinamong asymptomatic carriers]. Zahedan J Res Med Sci. 2006;7(2):131-8. Persian. 16. Kocoglu E, Karabay O, Yilmaz F, Ekerbicer H. The impact of incubating the throat culture for 72 h on the diagnosis of group A beta-hemolytic streptococci. Auris Nasus Larynx. 2006;33(3):311-3. doi: 10.1016/j.anl.2005.11.011. [PubMed: 16431061]. 17. Tarvij Eslami S, Nasirian H. [Once-daily therapy for streptococcal pharyngitis with amoxicillin vs. Intramuscular benzathin penicillin G]. Iran J Pediatr. 2007;17(2):161-6. Persian. 18. Gordon KA, Beach ML, Biedenbach DJ, Jones RN, Rhomberg PR, Mutnick AH. Antimicrobial susceptibility patterns of beta-hemolytic and viridans group streptococci: Report from the SENTRY Antimicrobial Surveillance Program (1997-2000). Diagn Microbiol Infect Dis. 2002;43(2):157-62. doi: 10.1016/S0732-8893(02)00374-7. [PubMed: 12088624]. 19. Ghaemi E, Tabarrayii A, Fazeli MR, Vakili MA, Bazouri M. [Prevalence of group A streptococcal carriers among school going children of Gorgan]. J Gorgan Univ Med Sci. 2000;6(2):55-61. Persian. 20. Durmaz R, Durmaz B, Bayraktar M, Ozerol IH, Kalcioglu MT, Aktas E, et al. Prevalence of group A streptococcal carriers in asymptomatic children and clonal relatedness among isolates in Malatya, Turkey. J Clin Microbiol. 2003;41(11):5285-7. doi: 10.1128/JCM.41.11.5285-5287.2003. [PubMed: 14605185]. [PubMed Central: PMC262532]. 21. Sharefiyan MR, Rashed T, Hetror H. [Study of aerobic bacterial growth and their antibiogram among 105 pharyngeal patients in Medical Center of Imam Reza]. Iran J Otorhinolaryngol. 2005;17(40):5-10. Persian. 22. Cengiz AT, Kiyan M, Ciftcioglu N. [Antibiotic susceptibility of group A beta hemolytic Streptococcus]. Mikrobiyol Bul. 1989;23(2):163-73. Turkish. [PubMed: 2696867]. 23. Brook I. Treatment challenges of group a beta-hemolytic streptococcal pharyngo-tonsillitis. Int Arch Otorhinolaryngol. 2017;21(3):286-96. doi: 10.1055/s-0036-1584294. [PubMed: 28680500]. [PubMed Central: PMC5495595]. 24. Pavlovic L, Grego E, Sipetic-Grujicic S. Prevalence of macrolide resistance in Streptococcus pyogenes collected in Serbia. Jpn J Infect Dis. 2010;63(4):275-6. [PubMed: 20657068]. 25. Luca-Harari B, Straut M, Cretoiu S, Surdeanu M, Ungureanu V, van der Linden M, et al. Molecular characterization of invasive and non-invasive Streptococcus pyogenes isolates from Romania. J Med Microbiol. 2008;57(Pt 11):1354-63. doi: 10.1099/jmm.0.2008/001875-0. [PubMed: 18927412]. 26. Koh E, Kim S. Decline in erythromycin resistance in group A Streptococci from acute pharyngitis due to changes in the emm Genotypes rather than restriction of antibiotic use. Korean J Lab Med. 2010;30(5):485-90. doi: 10.3343/kjlm.2010.30.5.485. [PubMed: 20890080]. 27. d'Humieres C, Cohen R, Levy C, Bidet P, Thollot F, Wollner A, et al. Decline in macrolide-resistant Streptococcus pyogenes isolates from French children. Int J Med Microbiol. 2012;302(7-8):300-3. doi: 10.1016/j.ijmm.2012.09.001. [PubMed: 23103047]. 28. Chang H, Shen X, Fu Z, Liu L, Shen Y, Liu X, et al. Antibiotic resistance and molecular analysis of Streptococcus pyogenes isolated from healthy schoolchildren in China. Scand J Infect Dis. 2010;42(2):84-9. doi: 10.3109/00365540903321598. [PubMed: 19883153]. 29. Del Grosso M, Camilli R, Barbabella G, Blackman Northwood J, Farrell DJ, Pantosti A. Genetic resistance elements carrying mef subclasses other than mef(A) in Streptococcus pyogenes. Antimicrob Agents Chemother. 2011;55(7):3226-30. doi: 10.1128/AAC.01713-10. [PubMed: 21502613]. [PubMed Central: PMC3122394]. 30. Ashja Ardalan A, Keshavarzi F, Fattahy Rad A, Baghbani-Arani F. [Determination of mef genotype in Beta-hemolytic streptococci group A strains isolated from patients in Sanandaj city]. Sci J Kurdistan Univ Med Sci. 2016;21:29-40. Persian. 31. Kargar M, Baghernejad M, Ghorbani-Dalini S, Hashemizadeh Z. [Evaluation of molecular mechanisms resistance to macrolide by S. pneumonia strains isolated from Nemazee and Shahid Faghihi Hospitals in Shiraz]. Sci J Kurdistan Univ Med Sci. 2012;16:83-91. Persian. 32. D'Ercole S, Petrelli D, Prenna M, Zampaloni C, Catania MR, Ripa S, et al. Distribution of mef(A)-containing genetic elements in erythromycin-resistant isolates of Streptococcus pyogenes from Italy. Clin Microbiol Infect. 2005;11(11):927-30. doi: 10.1111/j.1469-0691.2005.01250.x. [PubMed: 16216111]. 33. El Ashkar S, Osman M, Rafei R, Mallat H, Achkar M, Dabboussi F, et al. Molecular detection of genes responsible for macrolide resistance among Streptococcus pneumoniae isolated in North Lebanon. J Infect Public Health. 2017;10(6):745-8. doi: 10.1016/j.jiph.2016.11.014. [PubMed: 28215918]. 34. Jones N, Ray B, Ranjit KT, Manna AC. Antibacterial activity of ZnO nanoparticle suspensions on a broad spectrum of microorganisms. FEMS Microbiol Lett. 2008;279(1):71-6. doi: 10.1111/j.1574-6968.2007.01012.x. [PubMed: 18081843]. 35. Tayel AA, El-Tras WF, Moussa S, El-Baz AF, Mahrous H, Salem MF, et al. Antibacterial action of zinc oxide Nanoparticles against foodborne pathogens. J Food Saf. 2011;31(2):211-8. doi: 10.1111/j.1745-4565.2010.00287.x. 36. Ghaderian HS, Mohammadi Sichani M, Yousefi MH. [Antibacterial activity of ZnO nanoparticles and filters coated with ZnO nanoparticles on eliminating Escherichia coli and Enterococcus faecalis]. Iran J Health Environ. 2014;4(2):37-42. Persian. 37. Atmaca SE, Gul K, Cleck R. The effect of zinc on microbial growth. J Med Sci. 1998;28:595-7. 38. Heinlaan M, Ivask A, Blinova I, Dubourguier HC, Kahru A. Toxicity of nanosized and bulk ZnO, CuO and TiO2 to bacteria Vibrio fischeri and crustaceans Daphnia magna and Thamnocephalus platyurus. Chemosphere. 2008;71(7):1308-16. doi: 10.1016/j.chemosphere.2007.11.047. [PubMed: 18194809].